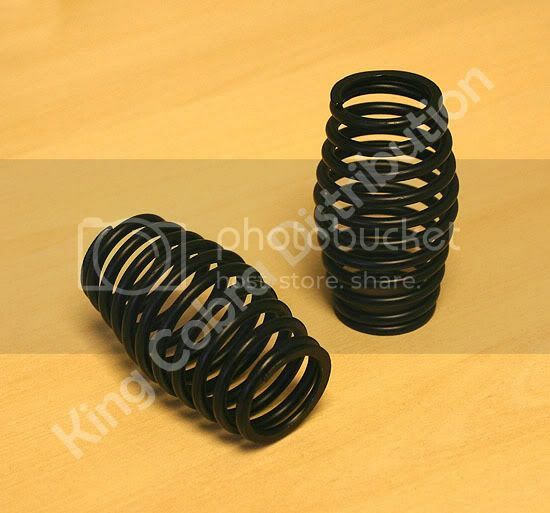 Following a suitable testing period on the UK off-road circuits, we are now able to offer our new long awaited Black Front Balloon Springs. Not exactly the best kept secret, as several of you who have seen them being tested have wanted to buy them "on the spot", and some of you who had the chance to try them were not exactly in a rush to give them back to us (!) as they worked so well. Anyway - the waiting is over, and they are now available at just Â£10.00 per pair - exactly the same price as the matching rear silver balloon springs we developed earlier. The longer Silver Balloon springs are very popular for use on the rear of the buggies, but we needed to find the correct weight and type of wire to make the matching front springs from - hence the long testing period. These new Black Front Balloon springs are superb when fitted to FG front shock absorbers, so they can be fitted to Marders, Marder Race, Leopards, Beetles etc etc. They also worked well on Horman, HARM and MCD cars too, so why not try them on yours to see how much better they make your own car feel? The springs give a really smooth "plush" feel to the car, and when balanced with the matching longer Silver Balloon springs on the rear, the car almost seemed to float over the rough stuff.